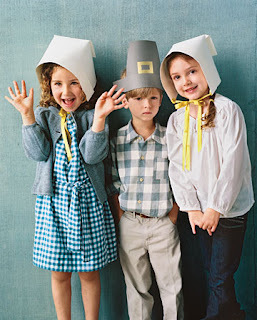 OLD HOUSE HOMESTEAD: Pilgrim Hats! I joke a lot about not being anything like Martha, but I really like her. I know some people don't care for her but she (and her gazillion member staff) have a lot of great ideas! I got this in my inbox just now and thought ya'll might like it! Go HERE for the how-to. The little guy in the picture doesn't look all that thrilled though. LOL! Oh my goodness, I love these! my 4 kiddos will love making these and wearing them too. thanks for sharing!